Balbriggan Golf Club Ladies Junior Foursomes had a terrific win against Elm Green Golf Club at Malahide Golf Club. Wins from Orla Sullivan, Maureen Moore, Orla Rooney & Marion Behan secured the match & Fiona Flanagan was called in on 18th. Managers Frances Newcomen & Maureen Walsh were delighted with the teams success. Next Date & Opposition to be confirmed. 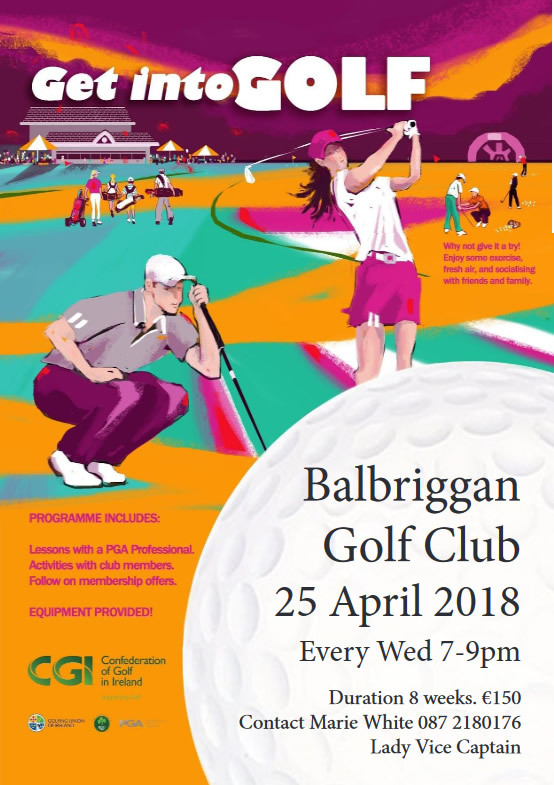 On Wednesday 25th April Golf Club is looking forward to welcoming the “Ladies Get Into Golf Group ” for 2018 – see further information in the poster below. Friday 27th April Open Golf Classic with fantastic prizes. Competition Format is a Rumble – Team of 4 Gents or 4 Ladies or 2 Gents & 2 Ladies.